Mid-Life Cruising!!! : New Pirates in Town! If you've been to our Facebook page recently, you already know what we've been up to lately. For the past two months I've been working morning till night on our two new web sites, Pickled Pirate and Pampered Pirate. Pickled Pirate features tropical bars and festivals, while Pampered Pirate features tropical spas/retreats and festivals. I started these sites in the hopes that they may eventually supplement our income when cruising. How will they bring income? Well, we've created some really fun t-shirts and backpacks that we're selling, as well as organic soaps, luxurious shower gels and lotions, and flavored lip balms. Wouldn't these make great gifts? We think so, especially for all those Bon Voyage parties! So, we'd really appreciate it if you'd check out our sites and pass the word around. You might even want to buy something! Our products aren't some "Dollar General" stuff, they're really good quality! We also have a link on each site to their own Facebook page. I'm still working on adding the products to the Facebook pages, but they should be posted soon. 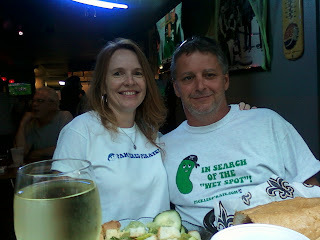 After officially launching the sites Friday night, Ken and I decided to take a break (I think my neck and shoulders are permanently damaged from all the hours at the computer) on Saturday and walk around the French Quarter. It was a fun and festive afternoon with plenty of Halloween costumes. 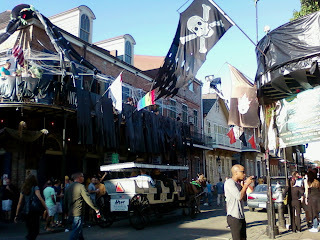 I was born in New Orleans, but I never get bored with the French Quarter and people watching! Ken and I decided to wear some of our new shirts, and it was amazing how many people noticed and commented on Ken's "Wet Spot" t-shirt. Even with all the costumes, his shirt was a hit! BTW, this is a terrible picture of Ken and me. I don't think we really look that bad, but what the heck ... I'm posting it anyway to show our shirts. Also, I've already posted other bad pictures of us and I need to get used to being seen in pictures without makeup. We will be cruising after all! 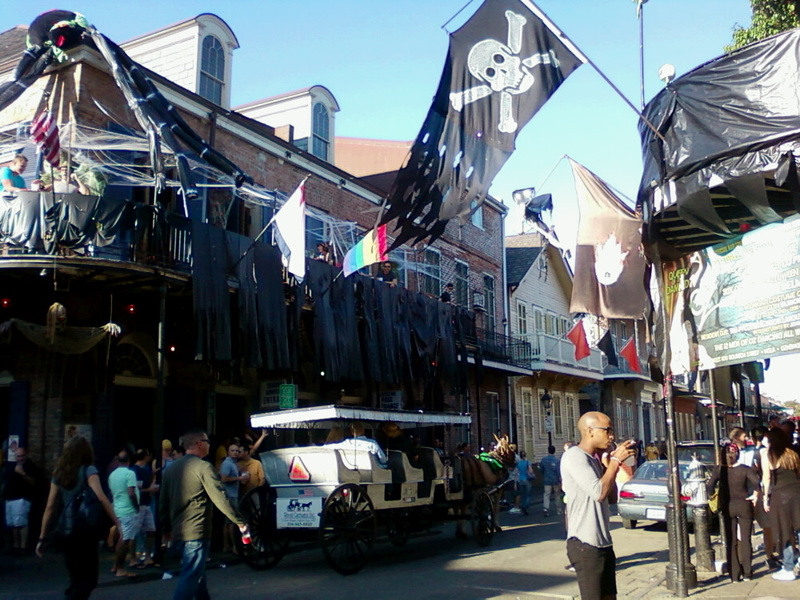 The French Quarter ready for Halloween and "Pickled" Pirates! Yesterday our friend Ted came over and helped Ken remove and replace the shackles and slides on our sailboat's mast. 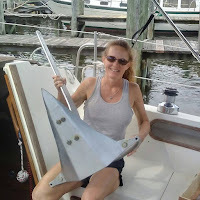 It has been really difficult to pull the main sail up, and this seemed to help quite a bit. Trying out the new shackles and slides in our backyard. Since kids don't seem to make it down our street, we spent Halloween night watching the Saints' victory against the Steelers.... not a bad way to spend the night! We hope everybody had a "Happy Halloween"! Do we have to start thinking about Thanksgiving now?! Congratulations on successfully launching The Pampered Pirate and The Pickled Pirate. I gave away two of your new Tee-shirts as door-prizes for my recent book-signing event. There are very nice. Very high quality. I love them! Eddie and I bought some for ourselves. Glad to see you two were able to get out and have some fun. 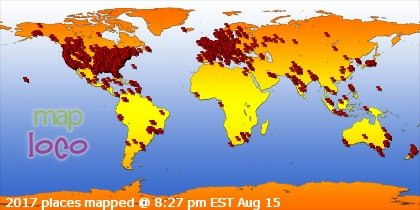 Good luck on your two new sites. I like their names. We went to the boat for the weekend to avoid all the kids that are bussed to our neighborhood. Way too many.